The prices for both crude oils finished the year lower than they began it. Brent and WTI each hit their highest prices during the year on October 3 at $86/b and $76/b, respectively. Prices for each benchmark fell quickly after that, and on December 24, Brent reached an annual low of $50/b and WTI reached an annual low of $43/b. Brent ended the year at $54/b, $13/b lower than it began the year, and WTI ended the year at $45/b, $15/b lower than it began the year. 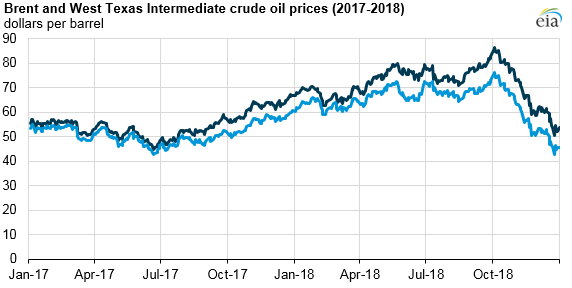 This year marks the first time since 2015 that crude oil prices for these benchmarks ended the year at a lower price than at the beginning of the year. o EIA forecasts that the Organization of the Petroleum Exporting Countries (OPEC) total crude oil and other liquids production will average 39.2 million b/d in 2018, down slightly from 39.3 million b/d in 2017.
o Although U.S. sanctions on Iran began on November 5, 2018, the United States granted waivers for some of Iran’s largest customers to continue importing limited volumes of crude oil for six months. o Crude oil production increases in Saudi Arabia in the second half of 2018 partially offset Iran’s declining production as a result of the U.S. sanctions on OPEC’s total production levels. o Russian crude oil and other liquids production increased from an estimated 11.2 million b/d in January to a forecasted 11.6 million b/d in December. 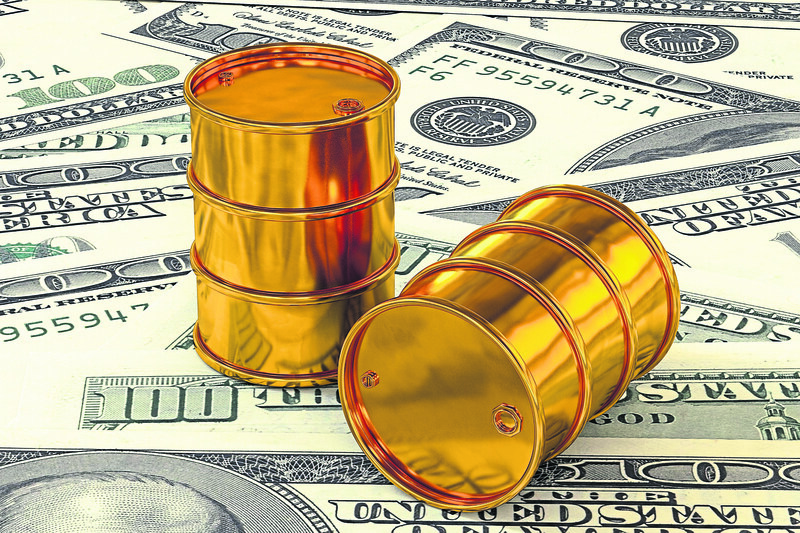 o In an effort to limit excess supply, on December 7, 2018, OPEC and other producing countries (including Russia) announced they would cut production by 1.2 million barrels per day (b/d) from October 2018 levels during the first six months of 2019.
o U.S. crude oil and other liquids production increased in 2018, and EIA forecasts it to average 17.8 million barrels per day (b/d) for the year, the highest level on record (EIA data going back to 1994 ) and an increase of 2.2 million b/d from the 2017 production level. 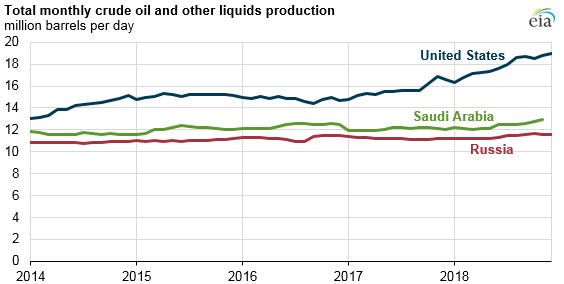 o The United States surpassed Russia and Saudi Arabia earlier in 2018 to become the largest crude oil producer in the world based on monthly data. U.S. crude oil production was at record levels in 2018, and in the December Short-Term Energy Outlook, EIA forecasted that 2018 annual crude oil production would reach 10.9 million b/d, surpassing the previous annual high of 9.6 million b/d set in 1970.
o U.S. crude oil exports averaged 1.9 million b/d in 2018, about twice the amount that was exported in 2017. Crude oil overtook distillate as the largest U.S. petroleum export. o The growth in U.S. exports of crude oil and petroleum products led to a one-week period in late November when the United States was a net exporter for the first time in EIA’s data history.